For those of you who prefer a bar of soap to a bottle of body wash, there’s a jasmine-scented dream for you, too. As this post marks the halfway point of the #12DaysOfJasmine series, I’m excited to share one of the most beautifully packaged soaps to grace my bathroom soap bin: Saavy Naturals Jasmine Bar Soap. “Those Saavy soaps are pretty,” says my boyfriend, the textbook Taurus who respects well-made, well-designed things. But Saavy soaps are more than just pretty. Stripped out of its delightful packaging, Saavy’s Jasmine Bar Soap is a generous 8 ounces that is easy to handle in the shower, lasts a long time and fills up the steamy air with the most exotic scent of jasmine sambac extract. Made with kukui, moringa, argan, olive and jojoba oils with a shot of shea butter, Saavy Naturals Jasmine Bar Soap is one of the creamiest bar soaps I’ve ever used. It creates a rich lather with generous bubbles that moisturize — never strip — your skin and fill the air with the scent of jasmine and touches of bergamot and chamomile. Alchemilla Vulgaris Extract, Aleurites Moluccana (Kukui) Seed Oil* Moringa Pterygosperma Seed Oil*, Allantoin, Aloe Barbadensis Leaf Extract, Aloe Barbadensis Leaf Juice*, Althaea Officinalis Root Extract, Aqua/Purified Water, Argania Spinosa Kernal Oil (ARGAN Oil) Chamomilla Recutita (MATRICARIA) Flower Extract, Butyrospermum Parkii (SHEA) Butter, Cetearyl Glucoside, Cetyl Alcohol, Citrus Aurantium Bergamia (BERGAMOT) Fruit Oil, Equisetum Arvense Leaf Extract, Gliceryl Stearate Se, Glycerin, Glyceryl Stearate Se, Jasminum Officinale Oil, Jasminum Sambac (JASMIN) Extract, Lonicera Caprifolium (HONEYSUCKLE) Flower Extract, Lonicera Japonica (HONEYSUCKLE) Flower Extract, Olea Europaea (OLIVE) Fruit Oil, Passiflora Incarnata Flower Extract, Salix Alba (WILLOW) Bark Extract, Simmondsia Chinensis (JOJOBA) Seed Oil, Tocopherol (Red Palm Oil)*, Xanthan Gum. I know we all like to say that size doesn’t matter, but with a bar soap, it really does! This 8-ounce bar is easy to handle and seems to last much longer than many of my favorite bar soaps (even when I treat them all the same and keep them dry and drained). 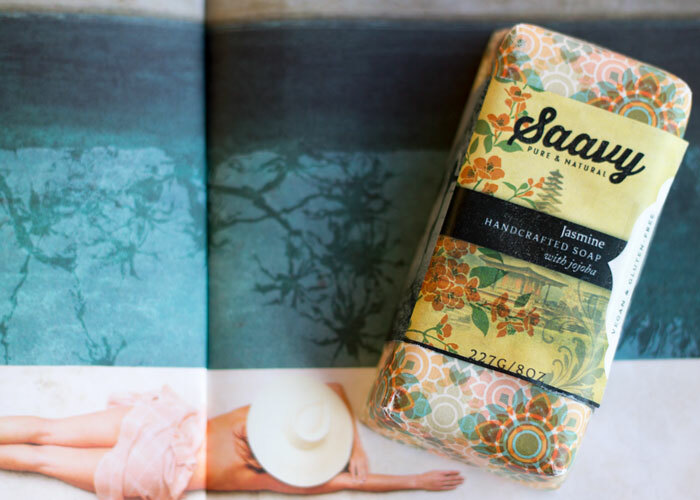 I also like that with this larger size, you can easily make the case for multitasking: Saavy Naturals Jasmine Bar Soap is just fine to use as a shampoo bar as well (talk about getting your jasmine on from head to toe!). It’s extremely gentle yet produces that oh-so-satisfying lather that makes it a dream to use in your hair. The willow bar extract is helpful at keeping flakes and itch at bay as well as any scalp bumps you may experience. Because Saavy Naturals is easily available via Amazon Prime (where my Prime members at?! ), it’s easy to stock up and save (just $8 on Amazon!). I’m also eyeing the Bulgarian Rose Soap and Bulgarian Rose Body Wash. These are just the perfect display (and use!) 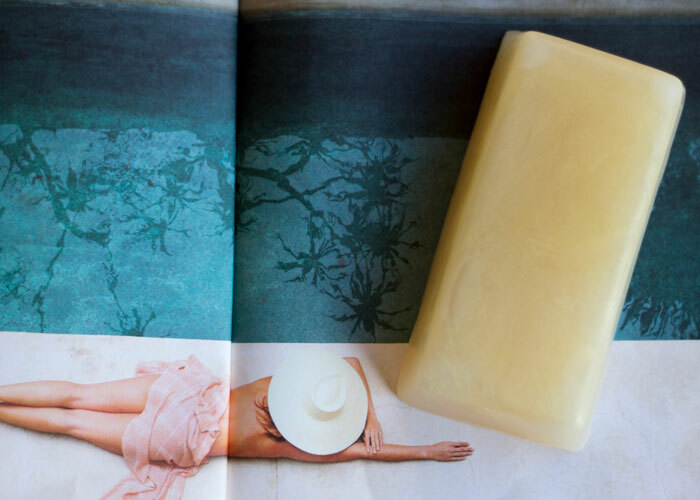 soaps to have in your master and/or guest bathroom. Have you tried anything from Saavy Naturals? What kind of soaps are on display in your bathroom? Tell me in the comments section!